§ March 24th, 2017 § Filed under buttons, employee aaron, pal plugging, swamp thing Comments Off on No, not actual horses. Why yes, that is Swamp Thing as drawn by Steve Bissette and John Totleben from Saga of the Swamp Thing #21 (1984). Now to await a formal occasion for which I may use said pin as the perfect complement to my coat and tails. 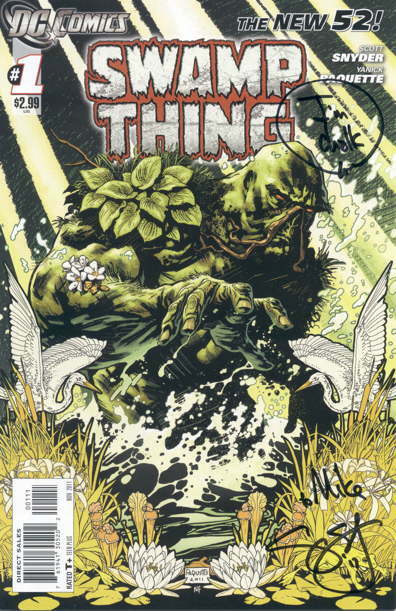 So Brian Cronin over at Comic Book Resources put up an article discussing the old Nickelodeon TV show Video Comics , which I talked about myself, due to the Swamp Thing connection, about four years ago. Brian was good enough to link back to my old post, since I had a few additional memories about the show not covered in his article. Thanks, Brian! Hey, Matt Wilson is running a Kickstarter to fund his next comics project, Everything Will be Okay , done in conjunction with Joe Hunter, Rodrio Vargas, and Josh Krach. Looks like it would be fun, and they have a little ways to go yet on reaching their goals, so pitch in if you can! And speaking of pal Andrew, his other ongoing project You Chose Wrong (celebrating the tragic endings of Choose Your Own Adventure books and similar book series) recently featured one of my submissions taken from a book I’ve previously discussed. WHO WAS THAT MASKED MUSTACHIOED MAN? 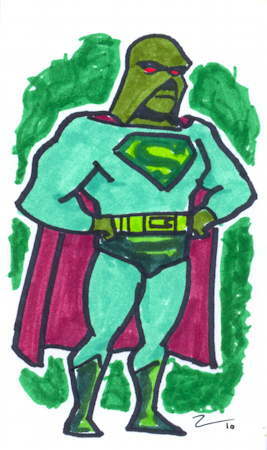 This is what DC Comics missed out on by not handing Swamp Thing over to me. 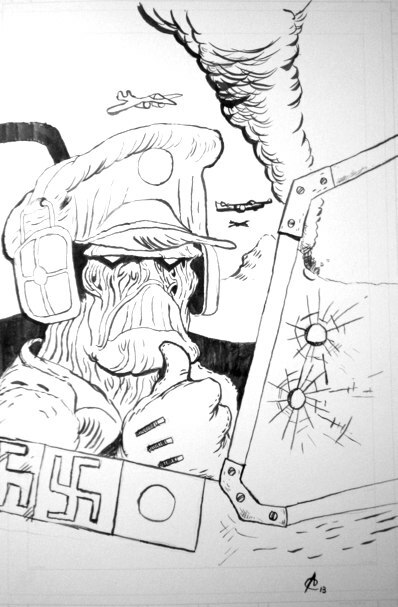 …but with our pal Swampy in the cockpit. I’m telling you, DC…call me. I’ll even buy the boy a ruler to keep his swastikas straight. The day after the day after Free Comic Book Day. I did indeed get a free comic. 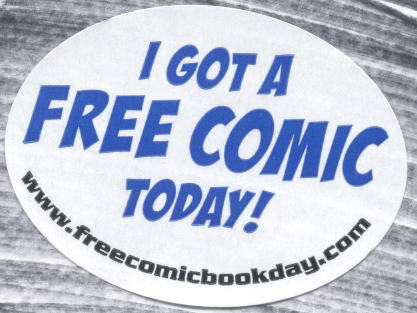 And so did the several hundred folks who passed through our doors on Saturday, most of whom didn’t get just one free comic, but many free comics pulled from the several tables we had set up for funnybook distribution. …is from much later in the day, when we’d taken down one of the tables once we were out of a handful of titles. But this should give you kind of an idea of what was goin’ on at our store for pretty much the entire day. And yes, that’s a shelf of pogs. There is no escape. Those were the only pics I managed to take; Employee Mark took more photos but hasn’t yet sent them to me, but as soon as he does, I’ll toss ’em up on the site. One of those photos includes me, so consider yourself warned. Anyway, remember how in this post I mentioned I was going to de-emphasize the distribution of our free comics in age-appropriate bags…a bag of freebies for kids, one for teens, one for grown-ups. Well, I de-emphasized the heck out of it since I ultimately decided not to bag any of the comics at all. The goal was to keep some stock of freebies through most of the day by not giving everything to everybody. And I have to tell you, that morning, as I was unloading and stacking all the comics on all the tables I had a moment of panic. “Oh man, we’re never going to get rid of all of these, I shoulda bagged ’em, oh we’re screwed,” which is a variation on my usual FCBD pre-opening panic that no one’s going to show up and that it’ll be a disaster. Shouldn’t have worried. We were slammed from the second we opened our door at 10 AM, and the store was crammed full with people until mid-afternoon, when things slowed down to just merely insanely busy. Seth and Employee Mark even had to function as gatekeepers for a couple of hours, standing at the door and letting customers in only a few at time, and we still had a line stretching around the interior of the store, down one side, across the back wall, and forward by the tables as they head back towards the the register and the exit. As previously noted, the shots of the store above were later in the afternoon, when folks were just heading straight in from the door toward the tables, when the crowds were slightly more manageable. Also as previously noted, we had a second register set up for cash only transactions, having learned my lesson from last time when we had register lines a mile long. As it turns out, not a whole lot of people carry cash nowadays, but enough did to help lessen line wait times at least a little. Back to this year’s free comic distribution test (i.e. “Mike was too lazy to sort out the comics into bags this time”), there were two main results. First, yes, as I’d hoped, the comic stock lasted a bit longer this time around. In fact, for the first time in a few years, I still had a small assortment left over, enough to fill a small Diamond shipping box, which is quite the reduction from the many dozens of Diamond FCBD shipping boxes I originally received. That’s probably a combination of the non-bagging and of my increased orders this time around. That’s okay…we’ve left some out for anyone who couldn’t make it in on Saturday. Second, it did increase customer wait time as everyone picked out the comics they wanted instead of just grabbing a pre-packed bag or three and running off. Nobody really seemed to mind, however, and the wait time wasn’t that long. Another thing I did this year was take a bunch of those bargain-priced comics we still had hanging around (all those 50-cent Invincible s and $1.00 “Image Firsts” and 25-cent Vampirella s and such) and put those out for giveaways, too. And that giant stack of free Marvel Point One s that Marvel overshipped to us a couple years back, and that one issue of Garfield that, ahem, I may have accidentally overordered by entering the wrong number on the order form and not noticing…all put out for giveaways, all gone. AND I think I am finally, finally out of that Avatar Comics Robocop freebie from years ago. I thought I was done with it before, but more keep turning up. But I think I finally unloaded all our backstock of books from FCBDs past. …Well, it wasn’t more than two or three shipping boxes’ worth, so it wasn’t that much, but it still feels good to have found good homes for them. We didn’t have any in-store signings or other planned special guests…there just wouldn’t have been room…but I did briefly greet pal Nat; got to see the bearded visage of Matt Digges and his non-bearded niece; reader Dave Z., who makes the trek from Bakersfield every year to get free comics that had been personally touched by my filthy, filthy hands; and hugged Gina, my former editor at Music Confidential magazine. 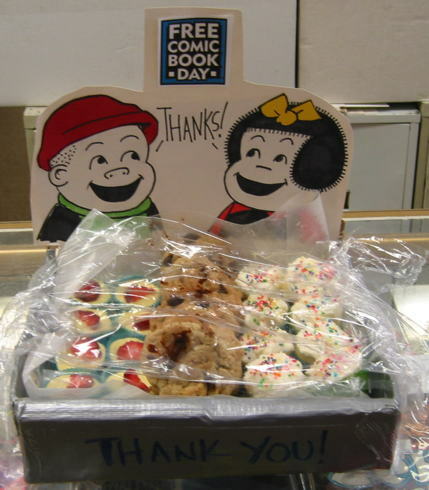 In addition to the goodies pal Casie brought us, Heather from the local library brought us a tray of cookies, thanking us for providing a bunch of this year’s FCBD books for them to distribute. And Employee Mark’s uncle Jay brought us his candied balls. …Before you ask, yes we did. How can you not. 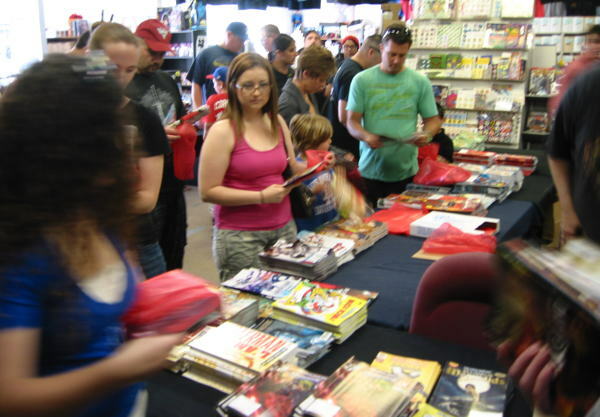 End result: the busiest, most successful Free Comic Book Day yet…gave away more comics than ever before, and made more money than ever before. 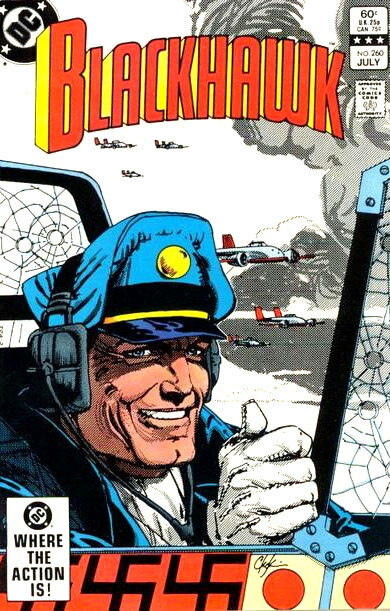 I’m not trying to be crass by mentioning the money thing, but it’s important to note that the expense of Free Comic Book Day…the cost of the comics, the employee wages, the trapeze artist, the stunt drivers…was more than covered. 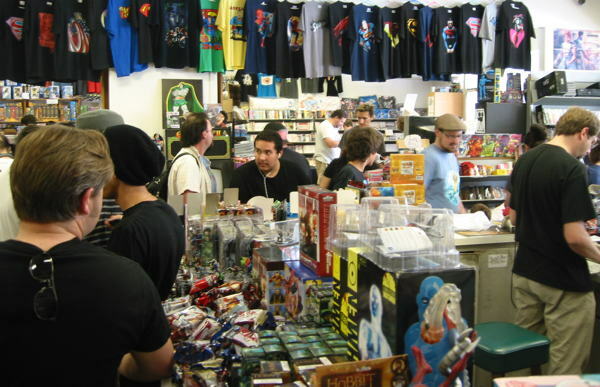 I have been sent a few stories, in comments and via email, from people whose own FCBD experiences at their local shops were less than exemplary. I’m sorry to hear it, but I’ve also heard from folks who had wonderful times, so maybe things have been improving on that front. 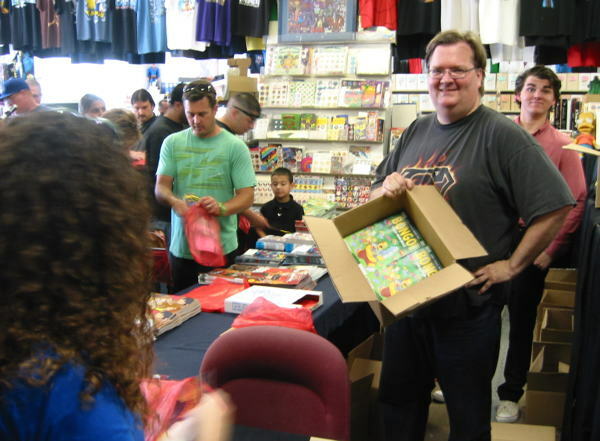 Like I’ve said many, many times before…it doesn’t take much to make Free Comic Book Day into an event, and boy, what an event we had this time around. Plus, I think I’ve convinced Seth into letting me spend even more money for Free Comic Book Day next year. 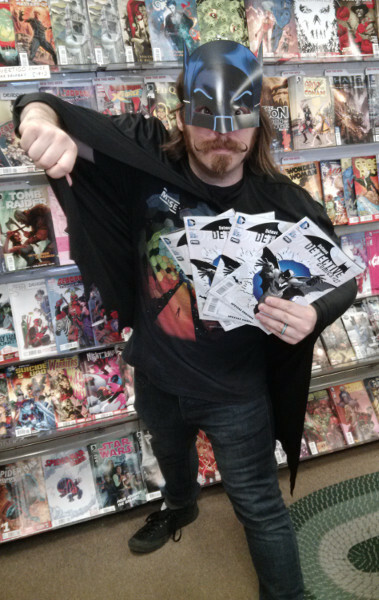 I should also note the efforts of Employee Robert the Friday night before, who did a lot of set-up rearranging part of the store to accommodate the free comic distribution. EFFORTS ARE NOTED. 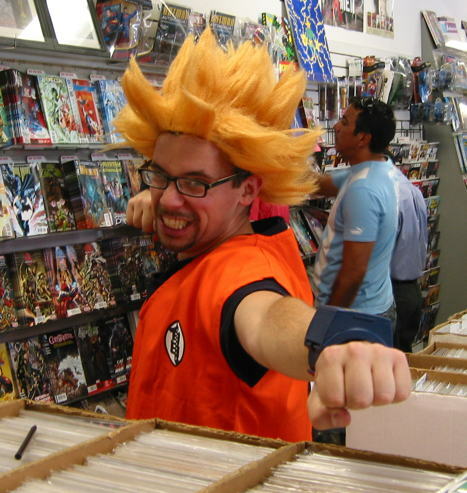 And yes, I know that’s Goku…don’t send me emails. His is a hairy and wild-eyed people. 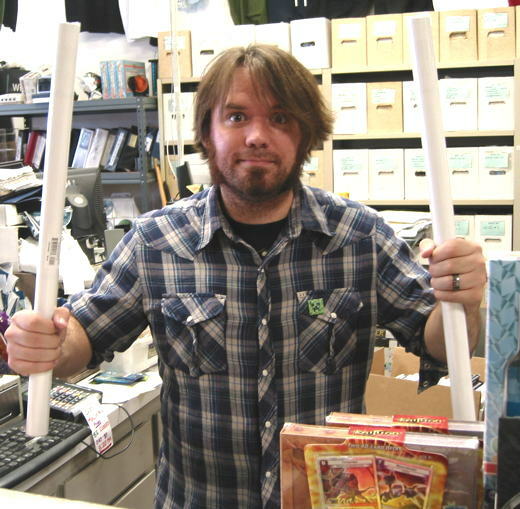 …pictured here wielding his clan’s traditional weapon of Spawn posters. 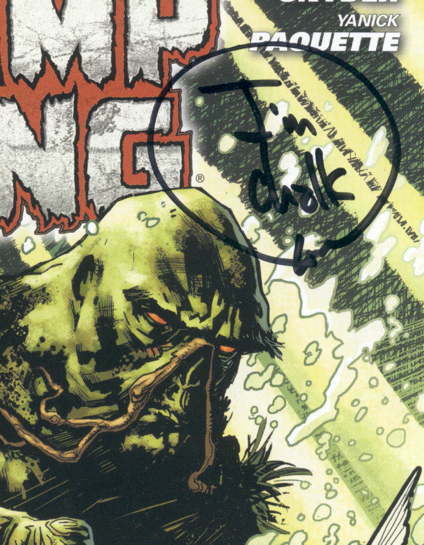 Anyway, I probably want to talk more about Swamp Thing — yes, I know, shocking — and some of your comments regarding Monday’s post, but that’ll wait ’til later in the week when I’m not dog-tired. But at the very least, reader Adam was good enough to post a link to Swampy’s cameo in the recent Robot Chicken special. 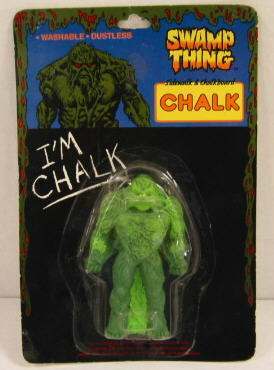 Very short, involves what could only technically be called “a joke,” but has some nice stop-motion animation using that recent Mattel Swamp Thing figure and a Barbie doll or something similar made up to look like Abby. WARNING: May have to watch a 30 second commercial before watching the 4 second clip. I wish I could have heard Aaron explain to Scott Snyder the significance of that particular phrase. 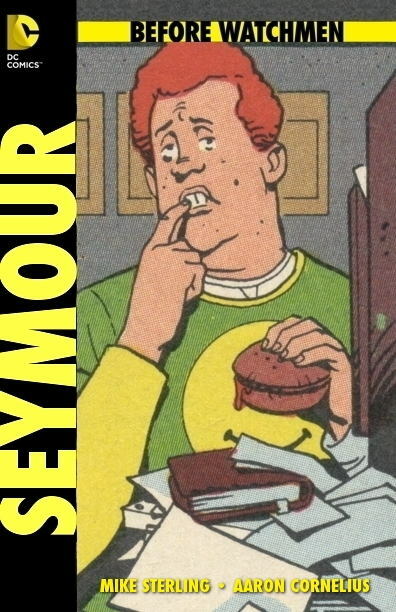 Anyway, between this and the War Rocket Ajax incident…well, Mr. Snyder probably isn’t thinking “oh, man, not another person bugging me about this Mike Sterling guy again,” but we’re getting there, surely. Sometimes you just have to take matters into your own hands. Saturday was the last day of Employee Aaron’s full-time employment at our humble funnybook store, so please join me in wishing him well in his new professional endeavor: SUPER SECRET SPY A GO-GO 3000. Aaron was a joy to work with, his cheerful demeanor always inspiring, and it’s not going to be the same without him. Well, mostly without him, as his new job as SUPER SECRET SPY A GO-GO 3000 is Monday through Friday, leaving the possibility of getting him into the shop on the occasional weekend. Plus, his lovely wife Kempo is still putting in a few hours at our shop every week, so he’s certain to come by the shop sometime…and then we can recapture him say hello. We’re going to miss Aaron around here, and we all hope the best for him. Good luck, pal! 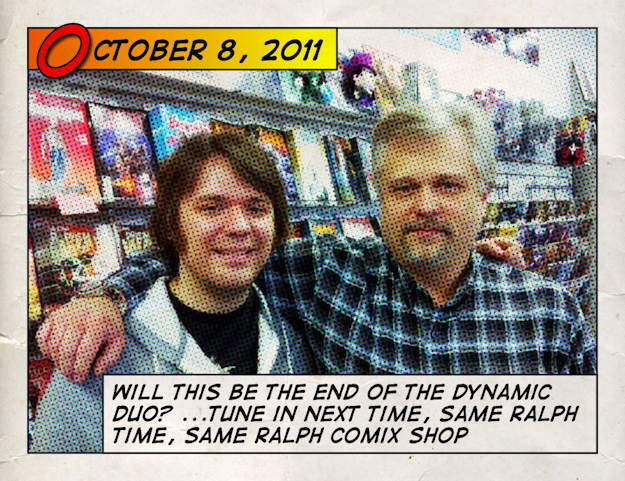 Special thanks to pal Kevin for taking the photo and comic-ing it up. That would be my little addition ruining Aaron’s drawing, in the right hand corner there. …WE MAKE A GREAT TEAM. 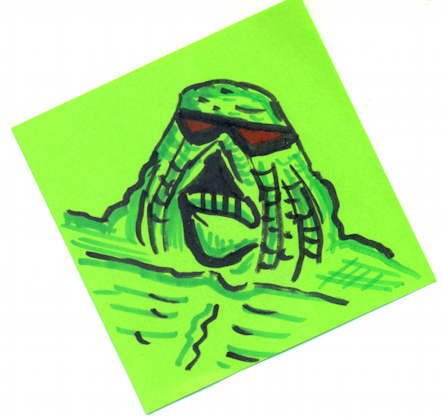 I was going to write about San Diego Con news, but here are some Swamp Thing sketches instead. 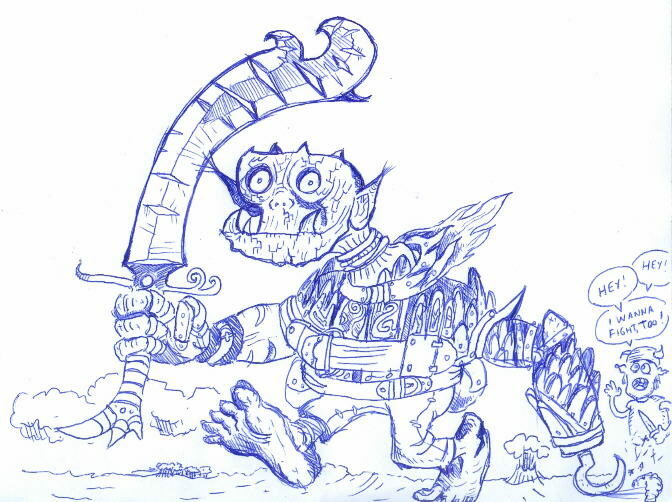 These are from internet chum Dan, and you can see more samples of his art over at his Tumblr (like Omac vs. Omac or totally awesome Metamorpho), and I’m guessing you can probably contact him through there for commissions of your own. 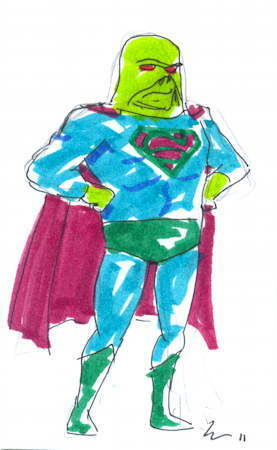 And before you ask…yes, I’ve been bugging both Employee Aaron and his lovely wife, who is also a talented artist, to start taking commissions. I’ll let you know as soon as they do…and it’d better be soon. Also, this is the greatest thing out of this year’s San Diego Comic Con.